Each year we expect to make around five grants of up to £150,000 to partnerships of arts/cultural organisations and up to ten schools, who will work together for two academic years. 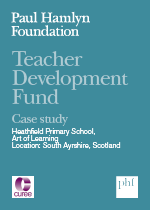 In order to understand the context of teacher continuing professional development and learning across the UK, PHF funded seven pilot projects (June 2016 to July 2018). During the pilot phase, we worked in partnership with the Centre for the Use of Research and Evidence in Education (CUREE) who undertook formative evaluation and delivered a programme of grantee learning. 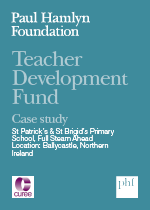 An evaluation report on the two-year pilot programme is available here. Case studies on four schools participating in the pilot programme offer helpful insight to schools looking to embed learning through the arts in the primary curriculum. Initial findings from the first year of the pilot phase is available here. 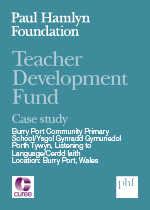 The films and blogs included in this area of the site give further detail about the purpose and priorities of the Teacher Development Fund and the work of the pilot projects. In round one, PHF awarded six grants to projects which will run from September 2018 to July 2020, led by Charles Dickens Primary School, Kent Special Educational Needs Trust, Sidegate Primary School, Sudbourne Primary School, Tees Valley Education and The Voices Foundation. 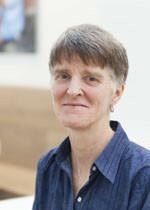 In round 2, seven projects led by the following organisations received grants through the Fund: Attain Academy Partnership t/a Chelmsford Teaching Schools Alliance, Morda Primary Church of England School, Parc Eglos School, Prime Theatre, Real Ideas Organisation, The Forge and Tyne & Wear Archives and Museums. These projects will run from September 2019 to July 2021. 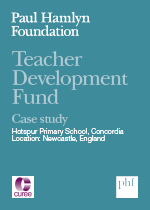 If you would like to find out more about the Teacher Development Fund, please e-mail ela@phf.org.uk. Paul Hamlyn Foundation has stepped in to enable teachers to access on-going professional development that will help them use arts practice across the curriculum. A new £1 million fund to boost arts education in primary schools has been launched by the Paul Hamlyn Foundation.